Wonderfully modernistic structures at a geothermal power plant in rural Iceland. I’d long wanted to travel to Iceland. Initially it probably had more to do with the name of the country, which is pretty exotic, than anything else. I remember, when I was a kid, that one of my friend’s sisters had worked in a fish factory there. While that’s not such an exotic notion, at least I knew it was possible to get there from Australia. Over recent years Iceland has become one of the world’s hotspots for great nature and landscape photography. I wasn’t disappointed, on either of my trips. Iceland is both spectacular and sublime and it’s heaven for enthusiastic landscape photographers. 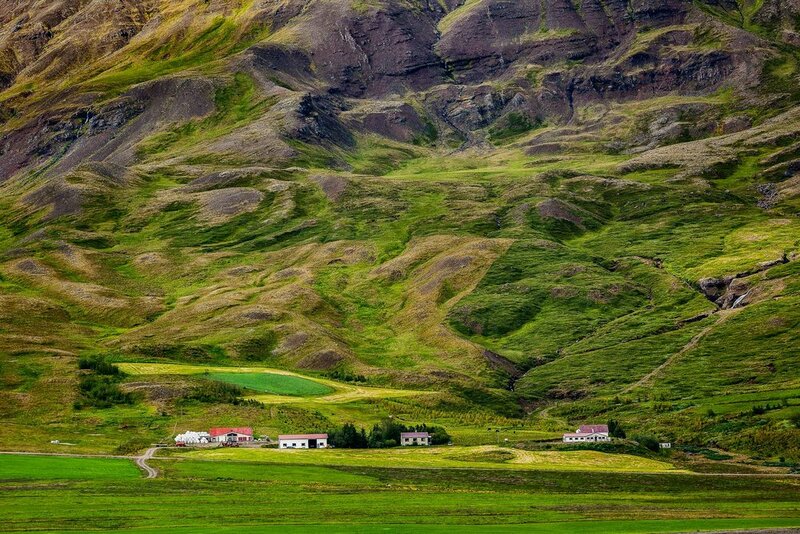 A dramatic mountain backdrop dwarfs a tiny hamlet, set amidst lush pastures, in rural Iceland. The landscape is varied: green around the coastal fringe with more rugged terrain as you move inland and up into the Highlands region of the country. Iceland experiences cold winters and cool summers, though the Gulf Stream ensures winters are more mild than most places at a similar latitude. There are said to be 1,000 waterfalls in the country, many of which are situated close to main highways and offer tremendous photographic opportunities. It makes sense visiting the more famous ones, but as Iceland has become such a mecca for tourists, it’s worthwhile trying to photograph a few waterfalls that are off the beaten track. It can be a bit disconcerting vying for a place to set up your tripod with a line of other photographers standing just behind you. The best thing you can do is to get to the busiest locations very early in the day. The alternative, in addition to visiting the iconic sites, is to check out some waterfalls that are off the beaten track. I think you’ll find photographing these quieter locations to be more contemplative, which will allow you to slow down, chill and enjoy the experience. Ice and feather on the black sand beach near the famous Jökulsárlón Glacier Lagoon. The famous Jökulsárlón Glacier Lagoon is a wonderful place to explore and photograph Icebergs, up close. An organized zodiac trip on the lagoon will allow you to photograph the icebergs, which have broken free from the nearby one thousand year old Breiðamerkurjökull Glacier, from a safe, but relatively close distance. The lower perspective you’ll achieve when photographing from the waterline will ensure the icebergs look even more majestic in your photos. Cold, blue light illuminating icebergs at the Jökulsárlón Glacier Lagoon in Iceland. The melting of the Breiðamerkurjökull Glacier created the Glacier Lagoon in 1935. The lagoon now measures around 18 km2. As well as being a popular place for sightseers and photographers, Jökulsárlón is also famous as a location in the James Bond films Die Another Day and A View to a Kill, as well as Lara Croft - Tomb Raider. Iceland has plenty of hot springs, geysers, mud pools and other such phenomenas to keep the geologically minded fascinated. A replica of a Viking village in a dramatic setting near Höfn in rural Iceland. The people of Iceland are interesting. The men are mostly big and strong while the women display a natural beauty. Icelanders come, originally, from Norwegian Viking stock and are said to have the purest blood line in the world. No doubt a consequence of living in such an isolated part of the world. It’s said that Norse settlers began migrating to Iceland in the second half of the 9th century. The first to have deliberately sailed to Iceland is said to have been Hrafna-Flóki Vilgerðarson who we know as Flóki from the popular series Vikings. I’ve found Icelanders to be very approachable, though often a little shy initially. They’re hard workers and proud of their very unique identity, wrought through an independent nature and an excellent work ethic. Young adults in the larger towns, particularly Reykjavik, are quite cosmopolitan and most speak English reasonable well. The music, photography and film scene is quite contemporary and experimental, yet traditionally Icelandic folk are said to be quite conservative with the majority claiming a Lutheran Christian faith. Despite this 10 percent of the population describe themselves as atheists, placing Iceland in the top 10 atheist populations in the world. To make matters even more interestingly it’s said that around half the population believe in the existance of trolls. And you might to if, like me, you start seeing faces appearing (naturally) in cliff faces around the country. It’s really quite extraordinary and goes someway towards explaining so many of the local myths that have survived over the centuries. Wonderful people, yes. Easy to define, no. I’m widely traveled, yet I still fall asleep most nights dreaming of Iceland. The country had such a profound impact on me. I doubt that I’ve ever felt such an affinity for a landscape, nor felt so in touch with the weather. And the light is something else entirely. The word photography comes from Ancient Greek and translates as light writing, drawing or painting. It’s true to say that I’ve never experienced the transient, transforming and transcendental nature of light as intimately as I have when photographing Iceland.